Food insecure families in the Panhandle received special support from neighbors this holiday season. More than 20,000 pounds of peanut butter were donated to food insecure families in the UF/IFAS Peanut Butter Challenge. “The Peanut Butter Challenge raises awareness of the important contribution of North Florida’s peanut growers to the state peanut industry, and it helps provide a healthy, locally produced product to Panhandle families who do not have easy access to nutritious food,” commented Libbie Johnson, UF/IFAS Extension agent and co-organizer of this event. 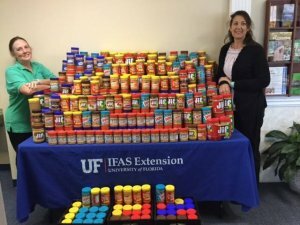 Since 2012, the Extension faculty, volunteers and the Florida Peanut Producers Association (FPPA) have collected jars of peanut butter from residents, organizations and businesses in the 16 counties that make up the UF/IFAS Northwest District. FPPA donated 11,340 pounds of the food and the public donated nearly 9000 pounds. “Our communities came through again this year with tremendous responses to our calls for peanut butter donations, and we thank them,” Johnson said. The peanut butter will be donated to 25 food pantries in the Panhandle on Dec. 15. Ken Barton, executive director of the FPPA, thanked Peanut Proud, a non-profit organization which provides hung and disaster relief to food insecure families, for helping FPPA buy peanut butter below retail cost. Peanut Proud has delivered more than 430,000 jars of peanut butter to disaster relief efforts and food banks throughout the Southeast United States, the U.S. Virgin Islands and Puerto Rico during 2017, according to its website.